Children | Are you making progress? Are YOU making progress memorizing Bible verses? You can do it! When Zechariah felt he could not do a job the Lord wanted him to do, the Lord encouraged him that it is "Not by might nor by power, but by my Spirit" (Zechariah 4:6) that those who obey and serve God are enabled to work. 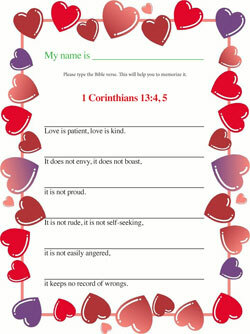 Learn by heart to say out loud 1 Corinthians 13:4, 5. A reminder to parents: The file on this website post is a "fillable form." In other words, after you open the .pdf file, your child can type into the boxes, helping him or her to memorize the Scripture verse(s) and to practice typing. If you save the .pdf file to your computer, you can also save what the child has typed in. You will need the most updated version of Adobe Reader, which you can download here. If there is a verse you would like us to feature in a .pdf file, use the Contact us form. The Lord is your shepherd. He will guide, protect, correct and love you throughout your whole life! It's important to memorize The Lord's Prayer! Does your husband share your faith? Don't give up!